It's not often I run across a new artist who boggles my mind, knocks my socks off, and makes me groove out all at the same time. This week I found one. 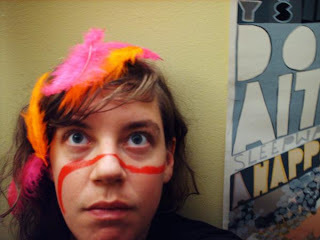 Tune-Yards (or more officially tUnE-yArDs) is the brainchild of one Merrill Garbus. In fact, it's pretty much a one-woman show, with some additional help for studio work and live shows. I missed the first Tune-Yards album, Bird-Brains, back in 2009 so the new album W H O K I L L was my introduction to the group's (?) music. I'm going to go ahead and call it a group for simplicity's sake. That work for all of you out there? Good. W H O K I L L is a chaotic, funky, riveting album not quite like anything I've heard before. I hear hints of Paul Simon in some of the beats, the indescribable funky swankness of TV On The Radio in the general feel, and even some Sonic Youth in the dissonance that ebbs and flows through the record. Still, it comes together in a way that's compelling and unique. And very good. Here's the second track, "Es-So." First of all, I'm a huge sucker for upright bass so they had me at the first pluck. The jazzy swing feel of the track only adds to my interest. Then you've got a ridiculously catchy melody and pretty amazing vocal acrobatics. There's a lot going on here and...well...I don't know what to say except that I really dig it. Here's another track from the album. For those of you who like a more visual approach, here's the video for their single "Bizness." Beyond that, I don't have much to say. Check this album out. It's definitely worth it.